Check-in, was a breeze, as it always has been. It’s really nice to see the tablets on the counter, instead of having to fill out a paper form. Since the booking was done electronically, all my information was already in the form, and all I needed to do was to present my valid ID. I was headed up to the 9th floor in no time. The room assigned to me in this stay was a Deluxe Room in the newly renovated Tower Wing. The new decor is bright, with cool accents that help you get right into relaxation mode. My room was right at the end of the hall, which is markedly different from the usual hotel room layout: it’s a U-shape. Instead of having the closet and the bathroom adjacent to each other in the entryway, there is just a full length mirror and an alcove with a small counter space, right beside the light switch, the key slot, and the air conditioning controls. The immediate view is of the desk, the side of the TV, and the sideboard right below, which houses the minibar. There is also a partial view of the divan and the center table with a bowl of fresh fruits. Once you get past the left wall, you see the bed, and you’ll have to make a U-turn to get to the closet and the bathroom. It’s actually quite nice to have this floor plan, as it give you the feeling that you have clearly separate areas for work, for rest, for primping, and for doing your private business. Similar to other Shangri-La hotels, there is a separate shower stall, which I absolutely love. There’s also an added extra: a shower bench, which will delight those who have problems standing up after a certain period of time, or even those who want to really clean between their toes. The toilet is fitted with a bidet, which while not as fancy or complicated as the Japanese toilet, is enough to get the job done. The hairdryer is also affixed to one of the drawers in the bathroom vanity, which spares you the search for a power outlet and a suitable place to dry your hair. Wi-fi signal is strong throughout the whole hotel, and Internet speed is very impressive indeed. 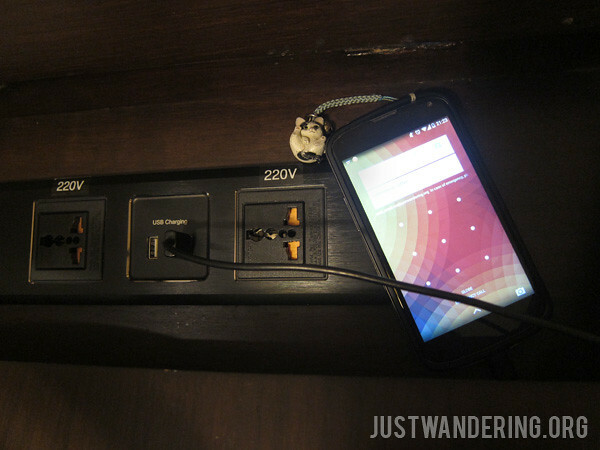 Aside from the wi-fi, another thing that I really loved about the room are the power sockets. All of them are universal sockets, and there’s even two USB sockets, which is perfect for those who just cannot leave all the gadgets at home. Before I can fully appreciate the fast Internet, I had to head down for my spa appointment at Chi. The spa is located at the Garden Wing, and the reception is temporarily at the 4th floor, and not in the hut near the swimming pool, which is where the gym currently is. The Chi spa offers different kinds of treatment, and vary slightly per country. 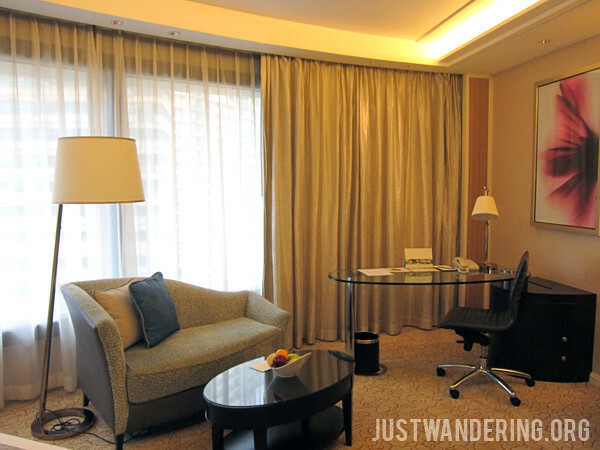 At Shangri-La Guangzhou, the massage I got there included some Wushu-style stretching. At Edsa Shangri-La, natural products have been incorporated into the treatments, like finely ground South Sea pearls in the body scrub and virgin coconut oil used for the hilot massage, which all contribute in giving the sense of place. 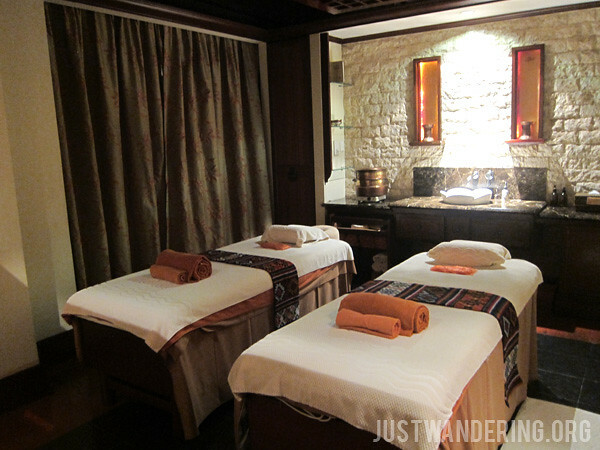 A spa treatment at Chi is the ultimate indulgence. It’s very serene, and maybe because it’s a Monday, not at all crowded. You can book a private treatment room and get a huge room with its own dressing room, locker, toilet, and steam shower. From Chi, it’s just one elevator ride up to the Horizon Club Lounge, which is at the 14th floor of the Garden Wing. The Lounge is exclusive for guests staying in the Horizon Club rooms. Drinks are available all day, and guests can use the lounge’s meeting facilities. There’s a good selection of alcoholic drinks, and you can make your own cocktail. If you’ve no confidence in your mixing skills, you can have it neat on a tumbler, or if you’re me, pour a white wine on a glass meant for red wine. I can’t remember what they’re called, but they’re all good. If you’re not up for getting delightfully tipsy (or horribly sloshed), there’s a mini-fridge full of non-alcoholic drinks, a coffee maker, and a dizzying array of tea leaves. Hors d’oeuvres are served between 5 to 7 in the evening, and while it’s not a full blown buffet, there’s a good enough selection of nibbles to tide you over before dinner. After attempting to do some work in my room (fast Internet is both a boon and a huge distraction), I headed down to Paparazzi, the hotel’s Italian restaurant. It’s the kind of place you take someone special, or someone you really want to impress. This is also the place to take someone who like wine. 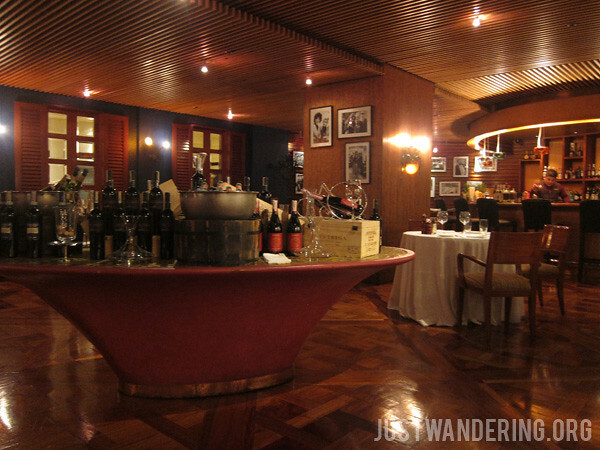 They have a good selection of wines from around the world, which would pair well with their creations. 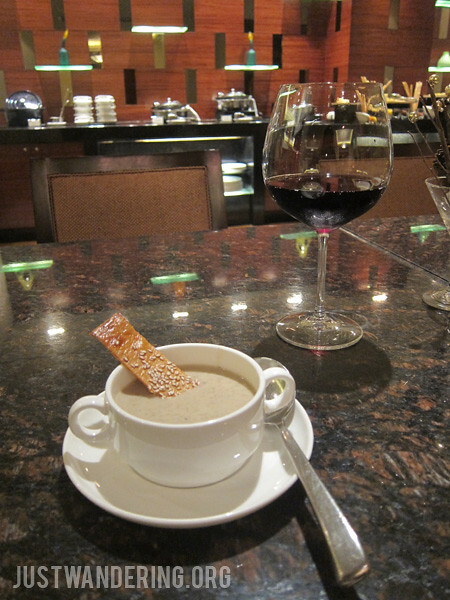 While the minestrone, pumpkin tortelli, and the lamb cutlets were very good, it was the tiramisu that stole the show. It’s so light and fluffy, yet full flavored. Your visit to Paparazzi is not complete if you do not try their tiramisu. I had two options for breakfast: back at the Horizon Club Lounge for relative quiet and peace, or down at HEAT, where all the other guests are. Having never gone to Heat, I opted to have my breakfast there, just so I can see what’s on offer. 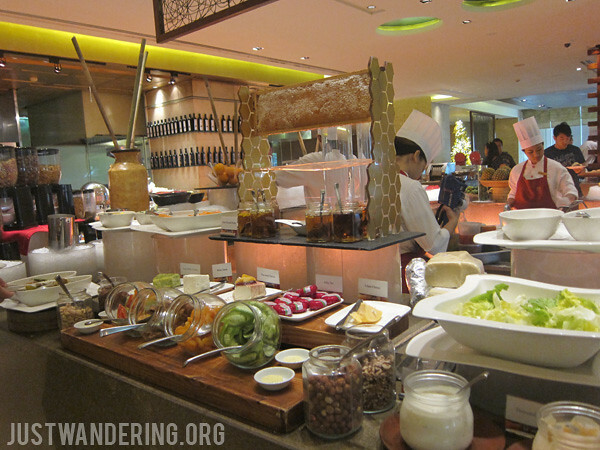 Since there is more space for the buffet here, I know that there will be offerings not available at the Horizon Club. 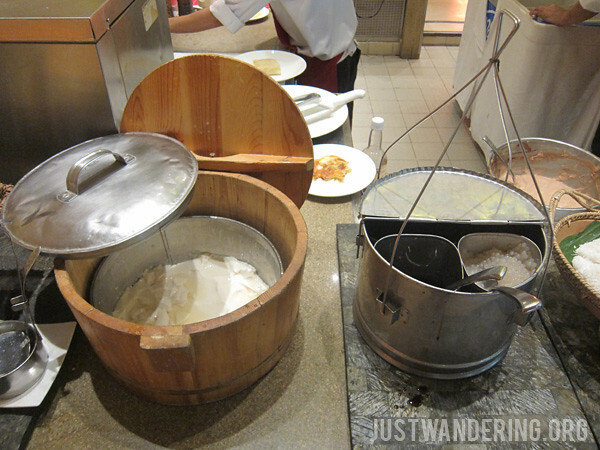 It’s an almost dizzying array of food, and as with buffets of this size, it’s hard to choose where to start. 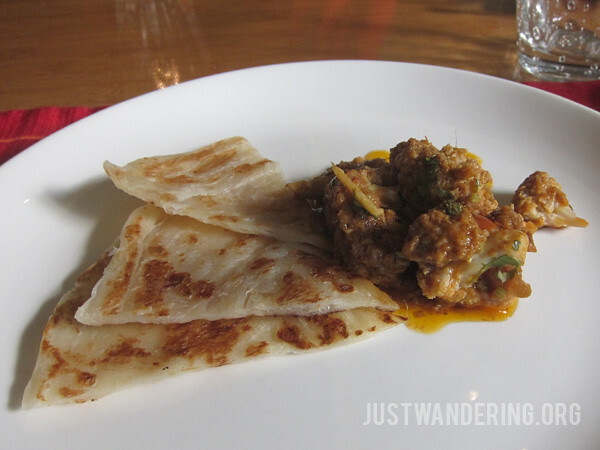 I walk around, checking out each dish on offer, until something I’ve been craving for caught my eye: roti canai. There wasn’t any curry, but there was a vegetarian masala right beside it, and I was happy. Despite the presence of two platters of bacon (labeled Bacon and Crispy Bacon), I gravitate towards the cold cuts with the pastrami, hams, and slivers of smoked salmon. With a dollop of mustard on the side, I tuck in, deluding myself that I am eating healthier. Well, I was, up until that point, anyway. I spied some Chinese dim sum on my first pass around the buffet, and I went back to sample some (they were all good), and on the way back to my table, I spied some native kakanin. A long standing craving for palitaw was fulfilled that morning, and in Shangri-La, of all places. This is just too awesome to have in a buffet! My breakfast at HEAT was capped with a bowl of taho, which I happily assembled to my preference — silken tofu in big chunks, plenty of sago, and just the right amount of arnibal. Lunch was at the Summer Palace, where I met Patrick Schaub, Edsa Shangri-La Hotel’s General Manager, Cristina del Carmen, Director of Communications, and Annie Gatchalian, Restaurant Marketing Manager. Lobster roll, scallop dumpling, shrimp and pork siu mai, and roast duck. 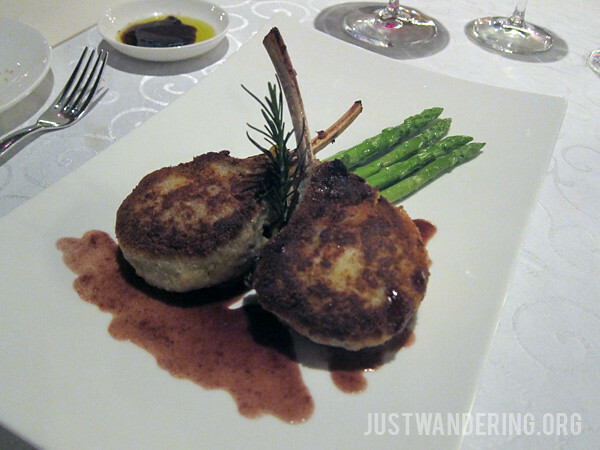 We were treated to a sampling of the restaurant’s best sellers. 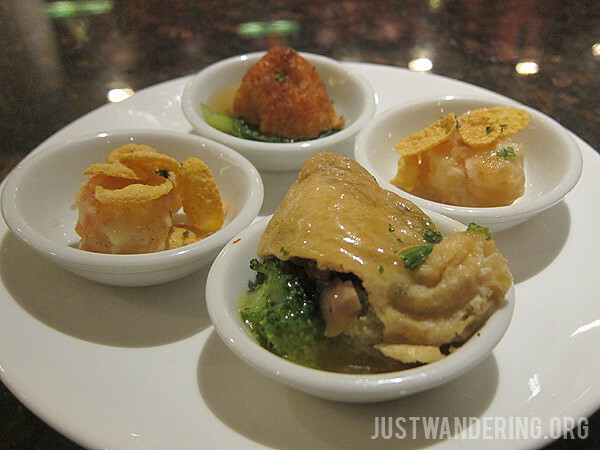 There was the dim sum sampler, which was an excellent introduction to the delights that come out of their kitchen. They are huge, varies in flavor and texture, and already tasted perfect eaten as is. It was followed with a huge bowl of their Four Treasures Soup, which, for some inexplicable reason, I can only describe as both light and full-bodied a the same time. The rice course came after, with deep fried battered fish with cheese, paired with yang chow fried rice. 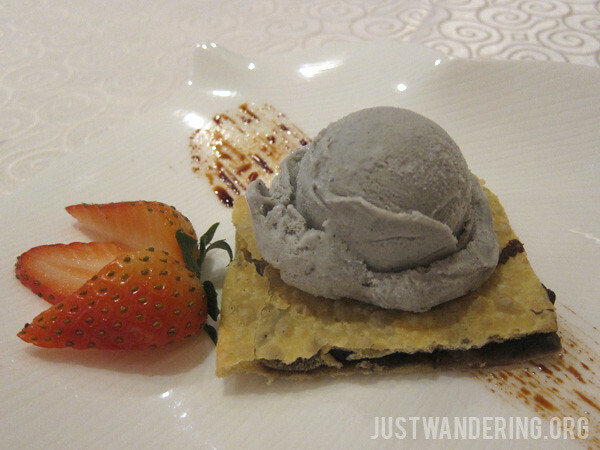 For dessert, we had their signature black sesame ice cream served on a Shanghai pancake. The pancake is actually a flat pastry with red bean paste. I’m not the biggest fan of red bean, but this agreed with my palate. I eschewed all plans to huddle over my laptop the whole afternoon, and opted to head down to the pool instead. It was a nice and sunny day, the kind not meant to be wasted indoors. The pool is mostly 1.15 meters deep, except for a cordoned off portion where it dips more than 2 meters. Similar to the pool at Rasa Sentosa Resort in Singapore, there’s a ledge that line portions of the pool, which is perfect if you’re just wanting to cool down on a hot day. The pool is open until 10 pm, but during the colder months, the water might be a bit chilly for some guests. Since the hotel is in the Ortigas CBD, the surrounding skyscrapers block the sun from the pool area. If you’re wanting to get a tan, the best place to have the sunbed is near the kid’s water playground, or near the lavatories. 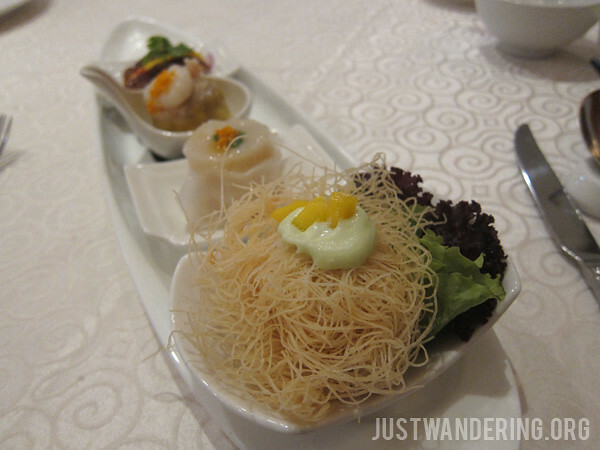 Right before I checked out, I had one last food tasting in my itinerary. 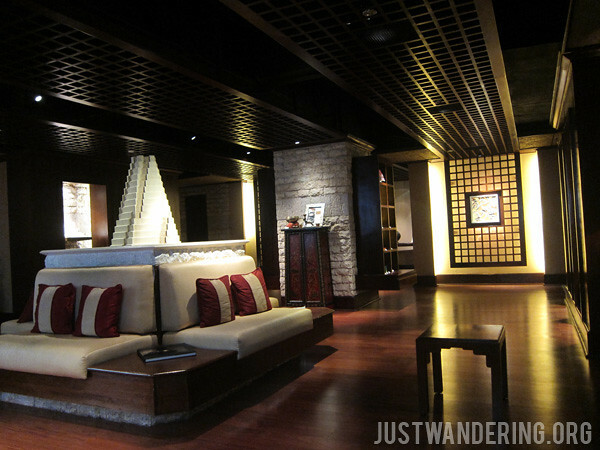 The Lobby Lounge of the Edsa Shangri-La is a great place to escape the crowds inside the popular cafes. All the seats are comfortable, and the service is impeccable. 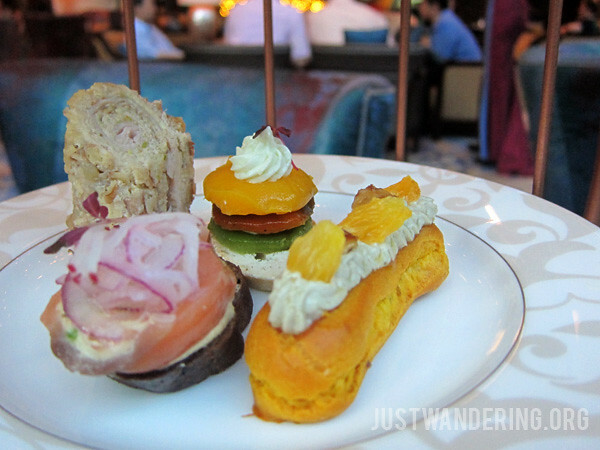 Their afternoon tea is a wonderful treat, if you’re up for some indulgence. Tea here is the whole she-bang: fine china, a full pot of loose leaf tea, and even sugar cubes. 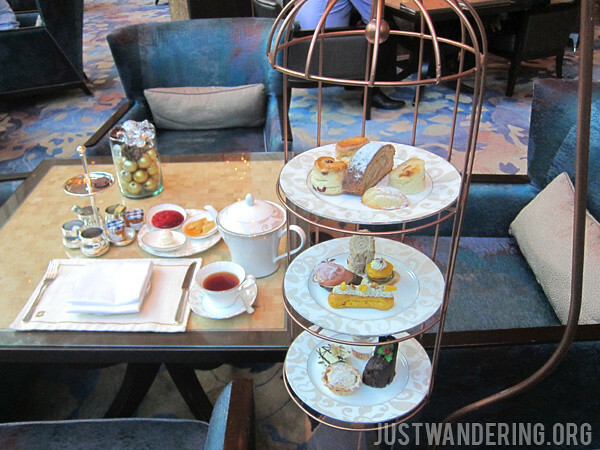 The little cakes and pastries are served on a modified bird cage, which is really just too cute. While the pastries are small, they can be quite filling, especially if you’ve already spent the entire day eating. I’ve never really seen the appeal of a hotel stay in the same city as your house, but I am seeing it now. 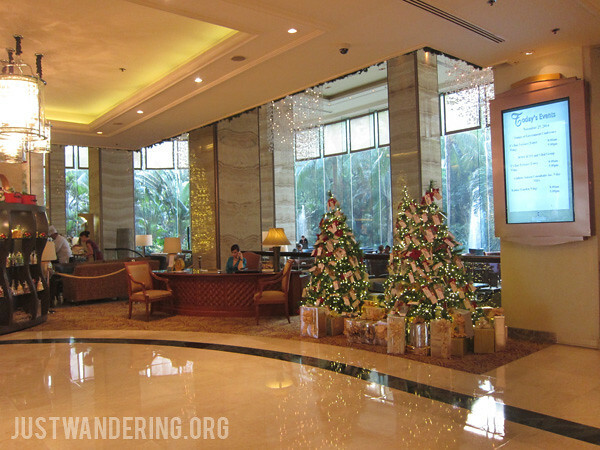 Once passed through the entrance to Edsa Shangri-La, it seemed as if the world outside ceased to exist. It’s an oasis in the middle of the city, where you can recharge before plunging back into the madness of real life. 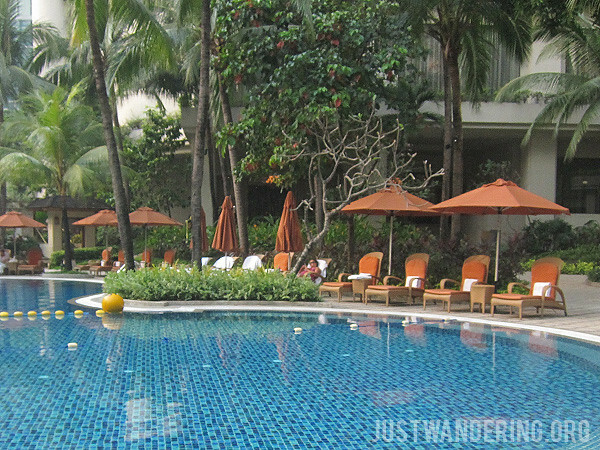 More photos from my stay at Edsa Shangri-La on the Just Wandering Facebook Page. Much love and gratitude goes out to Bonnie, Cristina, Kristine, Annie, Noli, Shiela, and of course, Mr. Patrick Schaub of Shangri-La for this wonderful birthday gift. splurging at its finest! kainggit! happy birthday teh! ? waiying or little tokyo soon, yes? 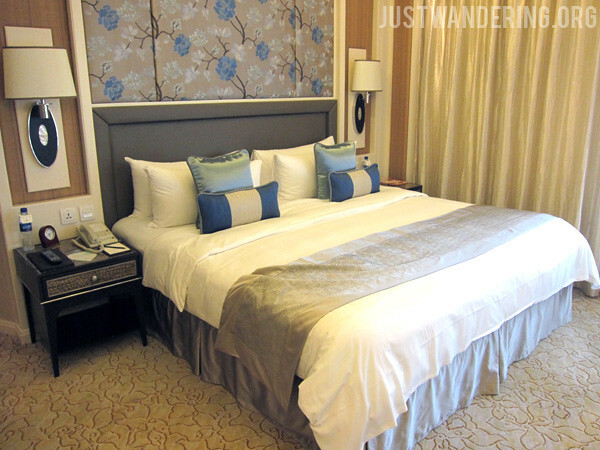 Edsa Shangri-La Hotel is one of the best hotels in the Philippines. They are 5-star hotels that offers the best of the best services to many customers.